A Common Myth that some clients and Nail Technicians believe is that nails need to breathe between services. Let’s set the record straight: Your nails are not living tissue. They don’t need to breathe. Nail technicians and clients have been saying for years that they should remove nail polish and/or enhancements to allow the natural nail to breathe. This could not be further from the truth. To prove this, it is important that nail professionals understand the overall makeup of the hand and foot as an entire unit. Blood vessels provide oxygen and nutrients to the hand, fingers, and nails through millions of tiny blood vessels. The veins carry waste and carbon dioxide away. This intricate process is what feeds the matrix, so the matrix can produce healthy nail cells. The natural nail plate is a moveable solid and rides a rail and groove track to move out and grow. It is primarily comprised of keratin (just like your hair). 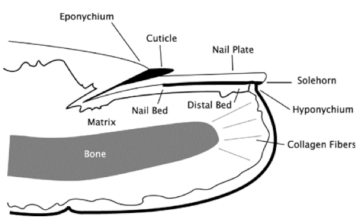 The natural nail plate is not living – it does not breathe. Because it is made up of non-living keratin, it does not HURT to have your nails clipped – same as it doesn’t hurt to have your hair cut. The nail plate is healthy when the health of the nail bed, matrix and surrounding tissue are properly cared for – it does not need to “breathe” to be healthy.